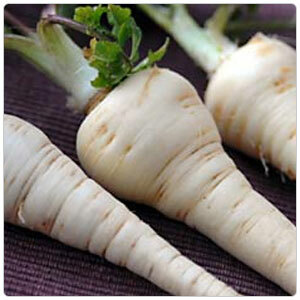 Parsnips develop their rich nutty flavor only after thorough cooking and are practically inedible raw. Parsnips make great additions to mixed roasted vegetables, purees, soups and stocks. Parsnips can also be fried and grilled. Root vegetables are underground plant parts that comprise a substantial part of year round vegetable crops. Root vegetables are rich in flavor, economical, versatile and especially good from October to March when our bodies crave heartier fare. Consider the list of vegetables pulled from below ground; potatoes, garlic, carrots, radishes, onions, beets, sweet potatoes, yams, turnips and many more. Root vegetables are staples of winter crops and are used in all aspects of restaurant menus-salads, soups, entrees, stews and as substantial side dishes. While the more common roots-potatoes, carrots, beets-are used year round, it is at this time of year that the less glamorous roots appear-turnips, parsnips, celery root, rutabagas and sunchokes. These lesser known roots are often referred to as lowly vegetables, not so much because of their below ground location, but rather of their overall status in the vegetable kingdom. These roots have enjoyed a renaissance of sorts and are now more prevalent in winter recipes and menus than in recent years. In general, root vegetables are low in calories, contain virtually no fat and add fiber and vitamin C to daily diets. The more deeply colored roots-carrots and beets offer beta carotene (vitamin A) and antioxidants that contribute to good health.